On June 28th, my colleagues in Classics & Philosophy as well as our Union representatives were abruptly told that our leaders were about to put proposals before Council that would emasculate the teaching of ancient Greece and Rome at Royal Holloway and make half its Classicists redundant. This means that for the first time in my life, I now have direct personal experience of a work community suffering from the drastic loss of morale which highhanded management creates. Our new professional Managers had of course failed to consult with us or our representatives ‘when proposals were still at a formative stage’, to quote the ACAS guidelines relevant to this type of situation. But our Managers’ failure to talk to their own people at an appropriately early stage and in an appropriately respectful manner is not just a violation of modern employment protocols. It also happens to be exactly the same mistake made by every single incompetent leader in ancient Greek literature, and there are quite a few of them. In fact, most of the greatest Classics focus precisely on the connection between the style of an individual leader and the success or failure of the community he leads. In the Iliad, it is Agamemnon’s demoralising insults to the most able members of his team, precipitate decisions, personal greed and intellectual shortcomings that make such a pig’s breakfast of the siege of Troy. In insulting the time-honoured local traditions represented by Chryses, disparaging his crack warrior Achilles, exuding negativity, taking more than his fair share of booty and privileges, and miscalculating the tenor and content of his speeches to the army, Agamemnon manages to delay the fall of Troy considerably, damage many relationships, dispel trust, and incur many more fatalities. In Sophocles’ Antigone, civic collapse is caused by Creon’s highhanded edicts, intimidating tactics and failure to listen to his citizens, when he has no previous experience of being the Chief Executive and has only just taken up the reins of power in Thebes. On the other hand, in Xenophon’s Anabasis, we are presented with an inspiring picture of the sort of leader who knows that morale is everything. The Greeks are stranded, in lethal danger, in Mesopotamia. They face material hardship, hostile tribes, and a Persian King with a deep grudge against them as well as an enormous army. 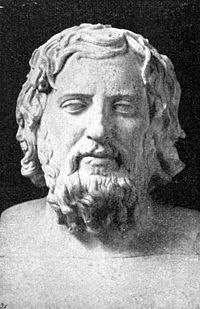 But Xenophon, the Athenian captain freely elected by the men who do the work, is aware of the importance of group solidarity, freedom of speech, and especially of proving that he does not regard himself as any more important or deserving than the ordinary soldiers. The morale he fosters in due course enables the Greeks to escape, despite numerous obstacles and hazards, to home and safety. We could do with a little more Xenophon and a little less Agamemnon and Creon in Egham right now.